Flat O, 8/F, Flat O, 9/F and Flat N & P, 12/F Kaiser Estate Phase 3, 11 Hok Yuen Street, Hung Hom, Hong Kong. Storage visit by appointment are welcome on other date. Q What can I store in my storage space? A You can store almost anything you want. Restrictions apply to items that may leak, will give off fumes or are flammable or illegal. You also cannot store perishable items such as food and vegetables unless they are canned or bottled. 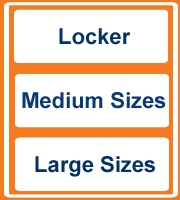 Q What is the storage space or locker like? A Each ROOM+ storage space is purpose-built using strong steel panels throughout. Q Do I share my storage space with anyone else? A No, each customer has their own private storage space for their exclusive use. Q What about humidity and temperature? A Since Hong Kong is very humid, ROOM+ uses a purpose built dehumidifying system throughout the building. Where temperature might be a concern, for example with clothes, artwork or furniture, some of our spaces are also air-conditioned. Q What security does ROOM+ have? A The security of your belongings is our ?rst priority. We have staff on site 24-hours a day and our buildings are ?tted with state-of-the-art access control, CCTV and alarm systems. Q Who keeps the key? A You do. The locking system on your door is secured by a padlock. This padlock belongs to you and you keep the key. Q How often can I access my storage space? A You may enter your storage space as often as you like, providing your account is up to date. There is no cost to access your storage space. Q What are your hours of operation? A Access to ROOM+ facility is available from 5am to 11pm, via our electronic access control system. Our reception is open from 9am to 7pm (Mon – Sat), 9am to 5:30pm (Sun) and closed on Public Holidays. Q Do I have to sign an agreement when I move in? A Yes. When you move into a self storage space you must sign the Storage Agreement. The storage agreement licenses you to occupy the storage space. Q How long can I stay? A There is no limit on how long you can stay. Your agreement will extend automatically each month for a period of one month. Q Do I have to book a storage space? A To ensure you have the right storage space when you need it, we recommend you reserve your storage space today by making a HK$75.00 holding payment. Q Can I move in today? A Yes. If we have storage space available you can move in straight away. Q How do I move my things into storage? A Most customers use a car or van to move their possessions into storage. At the facility ROOM+ can also provide friendly professional advice on to help make storing easier. Q Do you provide trolleys and carts? A Yes, ROOM+ has a range of strong trolleys which are provided free of charge to help you move your possessions to your space. Q Can you help me move homes? A Although ROOM+ is not a removalist, at each of our facilities we keep a list of companies that we can recommend for your consideration. Q How much will storage cost? A The cost of storage depends on the size, location features of your space. To receive an accurate price, please contact our trained sales consultants on 2331 7331 or send us an email to kwuntong@roomplus.com.hk. You will be surprised at just how affordable more space can be. Q What is included in the price? A The price quoted to you is inclusive of all utilities, security and service charges. Q Are there any other costs involved? A When you ?rst move into storage there is a one-off administration fee of HK$75.00. You will also need to purchase a lock for your space, which we can supply on site when you move in. You may also wish to purchase insurance for a little extra peace of mind. Just ask when you sign up for your space. Q When do I have to pay? A The ?rst payment is made on or before the day you move into your storage space. Each month thereafter payment is made monthly in advance. Q How do I pay? A We accept all usual methods of payment including cash, cheque, credit card, EPS and PPS. Q Do you sell boxes and wrapping materials? A Yes, we have a large range of professional packing materials and locks to help you protect your possessions. Please see our ‘Supplies’ page for further details. Q Can ROOM+ provide insurance? A Insuring your possessions with ROOM+ could not be more simple. ROOM+ provides a range of insurance options for customers, with coverage available up to HK$3,000,000. Simply ask one of our staff for details. Q Why do I need insurance? A Insuring your possessions provides a little extra peace of mind for those things you value the most. Q Can you accept deliveries? A Yes we can accept deliveries on behalf of customers. Please contact our staff for more details of this service.